Through the looking glass: I’ve long wondered why smartphone manufacturers haven’t taken a similar approach sooner. Instead of having separate front and rear cameras, why not have a single array that covers both? My vision didn’t involve a pop-up and flip-around solution but rather, an internal mirror mechanism that would somehow redirect a camera’s view to the front or back as needed. Samsung on Wednesday announced the Galaxy A80, a mid-range smartphone with a unique camera solution that gets around the unsightly notch to create a full-screen experience. The standout feature of the Galaxy A80 is without a doubt its pop-up camera. When you select the selfie mode in the camera app, the three rear-facing cameras automatically side up and rotate to face you. The gimmick effectively repurposes the high-quality rear-facing cameras, ensuring you won’t sacrifice quality when snapping selfies (most front-facing cameras are of lower quality than their rear-facing counterparts). Samsung’s triple camera array consists of a 48-megapixel primary shooter with f/2.0 aperture, an ultra-wide (123 degrees) 8-megapixel lens with f/2.2 aperture and a 3D depth camera. The Galaxy A80 also features a 6.7-inch FHD+ (2,400 x 1,080) Super AMOLED Infinity Display driven by an octa-core processor (2.2GHz x 2 + 1.8GHz x 6) alongside 8GB of RAM and 128GB of internal storage (sorry, there’s no microSD card slot for expansion). A 3,700mAh battery with 25W Super-Fast Charging capabilities should keep Android 9.0 Pie running for most of the day although Samsung isn’t yet discussing battery life estimates. 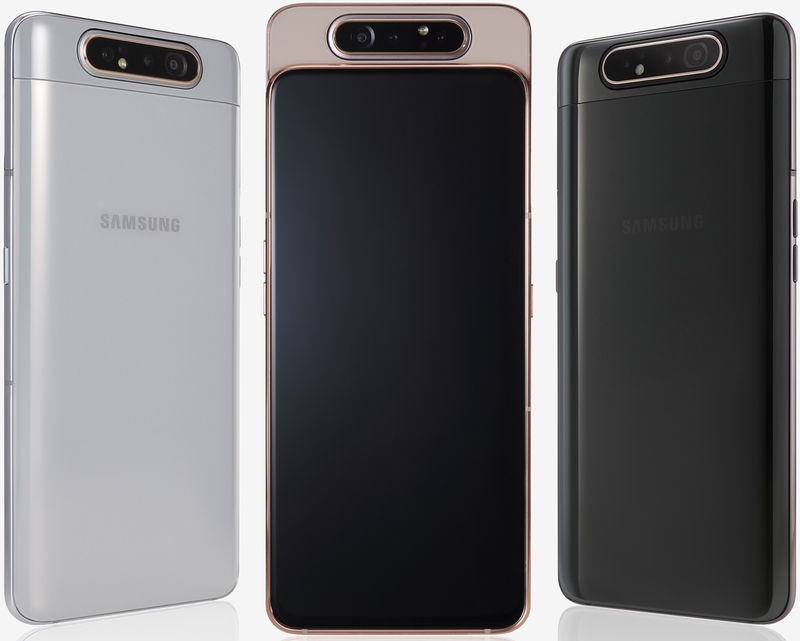 The Samsung Galaxy A80 will be offered in pink, white and black color schemes. It launches on May 29 in select regions. No word yet on potential pricing.